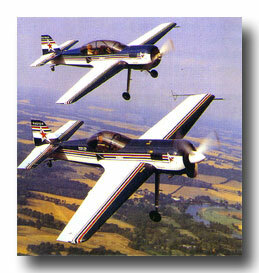 Quite simply the Sukhoi family of sport aerobatic aircraft are in my mind the ultimate in Aerobatic performance aircraft. Having had the wonderful pleasure of working with these incredible aircraft in the early 1990's at Pompano Air Center with Brian Becker and Clint McHenry, I gained the utmost respect for the SU-26, SU-29 and SU-31. Remarkably strong, agile and responsive this family of aerobatic aircraft emerged from the Sukhoi Design Bureau in Moscow which has a history that dates back to 1940, and that has developed quite a reputation for the bombers and fighter aircraft it has designed. 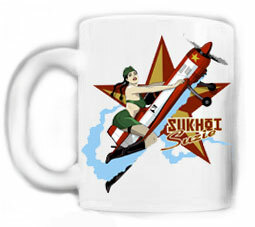 Sukhoi Design Bureau has established countless altitude and speed records over the years and was responsible for the SU-27 Flanker Fighter which to this day continues to astonish crowds at airshows and military exhibitions with the Cobra maneuver. Building on 60 years of design bureau knowledge and the vast resources which the Russians have been able to tap into with the collapse of the Cold War the Sukhoi aerobatic aircraft family stands alone as the most advanced aerobatic aircraft in the world. Lets talk serious performance. The nine cylinder supercharged radial M-14P engine develops 360 plus horsepower, which is geared and turns a massive 100 inch propellor giving the Sukhoi a much greater thrust than most 360 horsepower engine/propellor combinations are able to produce. When you combine this power combination with a very low weight, thanks to extensive use of composites and titanium. You gain a vertical line which seems to go on forever, and a standard rate of climb that well exceeds 3,500 feet a minute. Now combine this unbelievable climb performance with a an aircraft capable of roll rates that exceed 360 degrees a second, and control surfaces that have complete authority even at zero airspeed (thanks to full length ailerons and the massive propellor), and a seat that is reclined to allow the pilot to withstand the amazing +12 and -10 G limits of this aircraft and we are now talking about performance that is unique to one and only one production aerobatic aircraft family in the world.... Sukhoi. 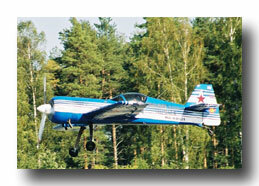 The Sukhoi SU-26 made it first appearance at the 1984 World Aerobatic Championships, and ever since more Sukhois have been in the winners' circles than any other aircraft. 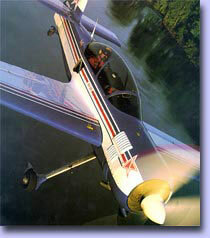 There are no aerobatic maneuvers currently known that can be performed better in any other production aerobatic aircraft. To quote Pompano Air Center's original Sukhoi brochure, "Nothing can touch it in vertical maneuvers, nothing can match the sound of its powerful radial engine, nothing can captivate an audience like this state of the art, technological wonder from Russia's leading design bureau. Nothing!"